I’m a persistent ‘hello-er’ – if we’ve spoke before (if even only once) then I will say hi to you when we pass on the sidewalk, whether you like it or not. I’m from Iowa, and IOWANS SAY HI! 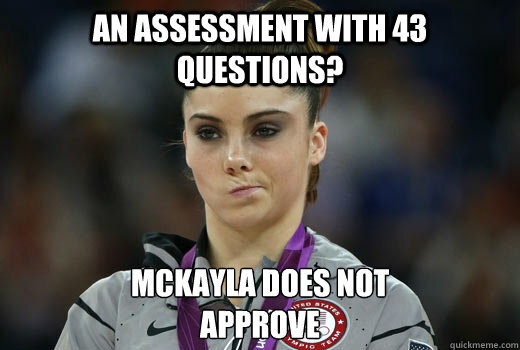 I looooooove the Olympics and to this day love the ‘McKayla does not approve’ memes. Have I also mention that I love stuff that is outdated (like this meme)?? Have a great weekend! See you Monday! This entry was posted in by Abby C. Trout and tagged friday, More than usual posts by ohnoitsanassessmentblog. Bookmark the permalink.